Oats Jaggery Kozhakattai for Vinayagar Chathurthi | Festival recipes. A long pending post, prepared last year. 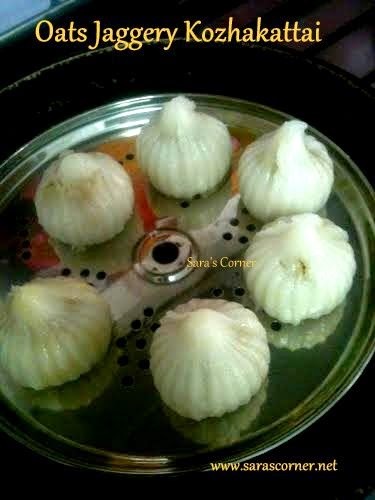 I had prepared this for Healthy Dumpling Festival in Singapore. I also taught many people to make the dough for the dumpling. It was fun doing this with any different people. Finding a right type of rice flour abroad is little difficult, unlike india. So I have used Idiyappam flour which is available in shops. Its fine and looks like milled one for Kozhakattai. Hot Water - 2 cups or more if required. In a wide vessel add oil, idiappam flour and salt. Boil water on stove or kettle add it to the flour, slowly mix with a spatulla continously to form a chapathi dough consistency. Allow it to cool. Mix again to form soft dough. Grease hands with oil and make small balls out of it. Close a clean wet towel on it to avoid drying. Take small balls and fill in the moulds. In a wide kadai, add jaggery with a tspn of water. Allow it to dissolve with stirring on intervals. if you feel it has dust particles, filter it and then keep again on stove. Add grated coconut oats, rava and cardamom powder. Mix till its thick and dry. Transfer it to a plate. Oats Jaggery filling is ready. Now take the rice flour, grease the mould with oil.fill a thin layer, then stuff this filling and close it. Slowly open the mould to form the beautifully shaped kozhakattai is ready for steaming. Boil water in a wide vessel or idli cooker. Grease the plates and steam the kozhakattai for 15mins or till the outer layer is shining and done.